Happy Kitchen Sink Stamps Monday, I hope you had a great weekend! Have you stopped by the new KSS Forum orGallery yet? There's a lot of wonderful KSS inspiration all in one place, as well as some weekly Challenges! 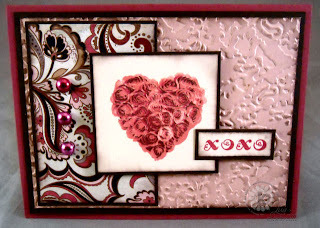 For inspiration I used Connie's Friday Sketch Carte Challenge, using the Multi Step Sweet Heart Roses to create a Valentine card. The background panel is embossed with the Texture Fades Damask folder then highlighted with Chocolate Ink. The Heart Roses are stamped in shades of Rose and Brown. Lisa - what a fantastic card. Love the backing paper and the rose image is just fab!! LOVELY Card! I really like the way you work with this KSS stamp in particular. I love all things Damask. I haven't seen that embossing folder anywhere before. Unless, you hand embossed it, perhaps? I think the Basic Grey Paper you chose is fabulous with this card. This is absolutely, one of my favorite KSS cards! Love this sensational mix of colors, patterns, and textures, Lisa! That chocolate layer really makes your pink roses pop!! Awesome work with this romantic beauty!! 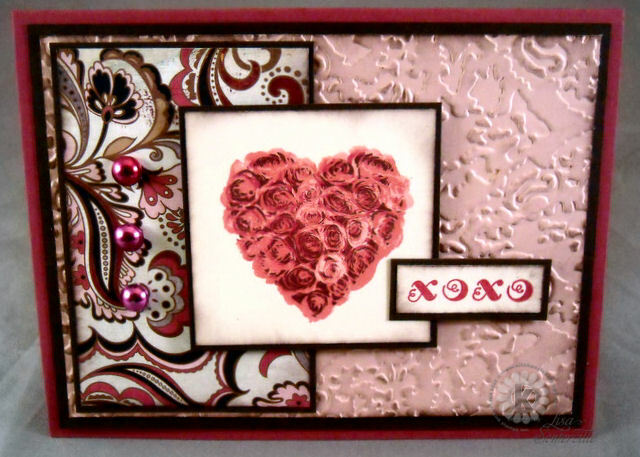 Beautiful Valentine's Day card and papers! Love the rose heart!! Oh Lisa! I love this!! LOVE your use of the sketch and the wonderful papers and distressing!! Hugs!! Gorgeous card. The color combo is wonderful. And of course, your choice of DP is exquisite. Lisa, I used the exactly same image and word for today's card!! I love the colors of your choice and the heart rose is so beautiful! Great start to the Valentine's cards! Wonderful colors. Just beautiful, Lisa! I love the combo with the Basic Grey paper! 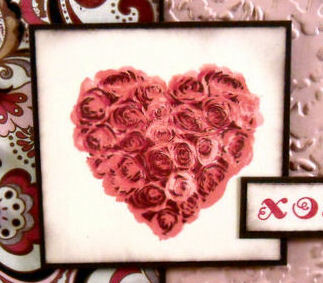 Gorgeous card Lisa... love how well the dry emboss and DP go together with the heart of roses! Awesome job on Connie's sketch challenge! Beautiful! Love that paper it works beautifully with your flowering heart! Love the DP and the texture. So rich and beautiful!